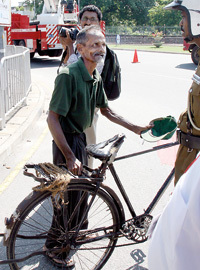 There was a dramatic scene that took place at the Dudley Senanayake commemoration ceremony which had been organized near the statue of the late Prime Minister at Borella on Friday. While the invitees waited for an apt time to garland the statue, a man dressed in bright green shirt rode up to the venue on a bicycle and first placed a bouquet of flowers at the foot of the statue. 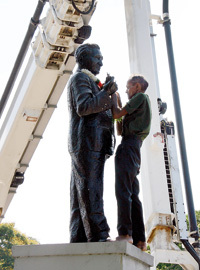 He then climbed the scaffolding and placed a garland round the neck of the statue and got off. Just as he was about to leave, a policeman stopped him and asked why he disturbed the ceremony. The man replied that this was something he did every year without pomp and ceremony and he was not going to do anything differently this year. The policeman had then let him go following which the man got back on his bike and rode away. The ceremony proper began shortly afterwards with members of the Executive Committee of the Dudley Senanayake Commemoration Society including former MPs Rukman Senanayake and Jinadasa Niyathapala garlanding the statue. Orations were after that. Jaffna 's former Municipal Commissioner C.V.K. Sivagnanam has written to President Mahinda Rajapaksa, protesting at the move by some officials to convert the computer room at the Jaffna Library into a toilet. In a letter, he says the library building has good toilet facilities on the ground floor and readers and visitors have been using them without problems. However, the problems started after some senior government officials attended a function at the library and later complained to Governor G.A. Chandrasiri that there were no toilet facilities on the upper floor of the building. Instructions had been sent out soon that the computer room on the upper floor be converted into a toilet. Mr. Sivagnanam who is an Assistant Secretary to the Illankai Thamil Arasu Kachchi (ITAK) has written to the President, asking him to intervene and stop this move. So popular in Europe, but what did Nirj Deva do for Lanka? It is no secret that the European Union worked hard together with the United States to get a resolution against Sri Lanka passed at the United Nations Human Rights Council in Geneva last month. The EU was one of the 40 co-sponsors of the resolution. When the EU's presidential election was held in January, Sri Lanka's Nirj Deva, a Member of the European Parliament, contested it and came second. He got 142 votes while the winner, Martin Schulz of Germany's Social Democratic Party, got 387 votes. British MEP Martin Callanan got 141 votes. Nirj, a Conservative, says his commendable performance at the election drew congratulatory messages from Britain's Conservative Prime Minister David Cameron and Foreign Secretary William Hague. Cameron in his message said, "As I said when we met in Brussels, I am very proud of your great achievement in gathering such strong support for your presidency of the European Parliament. It is proof of the affection and regard in which you are held by your colleagues. I am sorry it did not quite come off, not least because your presence would have made the European Council much more enjoyable!" Hague said, "I am sorry you did not win, but to have come second in circumstances that were not necessarily the most propitious for a British Conservative candidate is the clearest testament to the high esteem in which your colleagues hold you and your ability as a campaigner. Narrowly pipping the Lib Dem candidate was perhaps, the perfect coalition result!" Now the question is what this great campaigner was doing in Sri Lanka's central command room at the Intercontinental Hotel in Geneva during the UNHRC battle. His close links with the Tory leadership or numerous posts he holds in the European Parliament did not come to Sri Lanka's rescue. However, the man was heard complaining in Geneva that no media in Sri Lanka, his country of birth, picked the news that he came second in the three-man race for the European presidency. This year President Mahinda Rajapaksa and First Lady Shiranthi Rajapaksa had to celebrate New Year in the absence of their three sons. As the television commentator on the live telecast of the New Year celebrations from the President's home "Carlton" at Tangalla noted, their absence had dampened the New Year celebrations for the Head of State and the First Lady. Two sons, Namal and Yoshitha, were in the Philippines to take part in the Asian Five Nations Division 1 Rugby tournament which is the beginning of the Asia qualification process for the Rugby World Cup 2015 in England. The other son Rohitha, was also abroad. Former Sri Lankan president Chandrika Bandaranaike Kumaratunga said last Tuesday that she was "rather bewildered by India's decision to vote against the country at a US-sponsored UN resolution seeking action against Lanka on the purported war crimes committed during its almost three-decade-long war against the LTTE." Her remarks came in an interview with Suhasini Haider of CNN- IBN. Suhasni is the daughter of leading politician Dr. Subramaniam Swamy and is married to the son of former Indian External Affairs Ministry Secretary, Salman Haider. Suhasini Haidar: That's right 2009. Chandrika Kumaratunga: Was it 2009 when the last resolution came up? Chandrika Kumaratunga: And I noted, India supported us fully and even canvassed on our behalf so that we won... the resolution was defeated... so something must have happened in between for India to have voted against us, and I don't think India would have taken a decision lightly. Suhasini Haidar: In fact, do you think the government has done enough when it comes to not just convincing the world on human rights abuses, but actually working on the ground there? Suhasini Haidar: One of the ministers today has in fact said that India's vote dealt a killer blow to relations between India and Sri Lanka. Do you think that's the case? Chandrika Kumaratunga: Well you see, what you see in Sri Lankan press, we have a totally controlled press, if I may say so, may not be what the majority of the Sri Lankan people think. And India has not in the recent past tried in any way to obstruct Sri Lanka's policies and programmes and government. And I know personally that, well this is a publicly known thing that India has been asking for political settlement of the Tamil people's problem. And I have always held this view that ending the war does not bring peace by itself. That's obviously the necessary first step, especially to do away with terrorism, and you know all that kind of thing, but then thereafter there is a lot of rebuilding. Suhasini Haidar: There are hundreds and thousands of Tamilians today who have suffered from the excesses of the Sri Lankan army, and certainly of the war against the LTTE. Many have talked about torture. Do you think it's going to be possible for the people in the north and east of Sri Lanka to move on in this process of reconciliation? Chandrika Kumaratunga: Of course it is, if the government takes the lead. See what happened in South Africa. Suhasini Haidar: And India's role should be? Chandrika Kumaratunga: India's role should be to help us, to encourage our government, to move forward in this way, and India is doing that very effectively, but well one has to listen. Sri Lanka expects that tomorrow's visit by an Indian Parliamentary delegation to the country will help change the mindset of Indian lawmakers after they get to see first hand the progress made, particularly in the north, since the defeat of the LTTE nearly three years ago, Foreign Secretary Karunatillake Amunugama said. The 14-member Indian delegation will visit Jaffna and Kilinochchi and meet people resettled in these areas after the war as well as talk to administrative officers working there, Amunugama told the Sunday Times. "We want them to get a balanced view of what is happening in Sri Lanka. This is why we are keen that they visit the country," the Foreign Secretary said. During their six-day stay in Sri Lanka, the delegation, led by Lok Sabha Opposition Leader Sushma Swaraj will call on President Mahinda Rajapaksa and meet Tamil National Alliance (TNA) leaders. Amunugama said he hoped the Indian lawmakers would get the opportunity to see the real changes that had taken place in the country since the war ended and would help clear the misconceptions they had about what was happening in post- war Sri Lanka.